Hi, I'm Joe Rivera. It's a dream come true to have the opportunity to write about the things I love the most. I hope you enjoy my articles - and please feel free to email me any questions and concerns. Mac Fallout Shelter is both literal and metaphorical to its title. I'm an American soldier, and I relied on my Mac every day in the combat zones of Iraq. I used my Mac for work and pleasure. It became part of me. Under the stress of war, it gave me peace. I will be sharing firsthand accounts of what works and what doesn't. Before joining the military life I worked and lived with Macs every day - and that has not changed. I'm going to take you back in time and then show how to work with what you have. Mac OS 6, 7, 8, 9, and X will work together - even with the bad guys called windows. I'll show you how to make your life easier and more productive using your low-end Mac. From home networks to small businesses and from personal pleasure to mission critical work, it will all be easier with your Mac. Like many Mac users, I started out using Macs in my early years in school. I had to wait for a few years to own one. My first Mac was a Mac LC. I found it in the trash with no hard drive, so borrowed a monitor and a 40 MB hard drive, and I was in business. From there I started to fix or work with Macs both in school and for friends. After fixing a teacher's PowerBook 145 and (of course) take a look at the inner workings, I wanted my very own portable Mac to take with me at all times. I managed to get a PowerBook 100 by trading a Sony CD player, headphones, and $100 cash. It wasn't the fastest or the best, but it was a Mac. 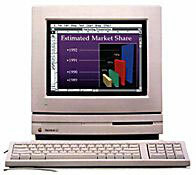 68000: The Mac Plus, because I own two of them and they have a SCSI port. I know the Mac SE is a bit faster and has ADB, but I have never owned one. If I did, I think it would be my favorite. 68030: I just simply loved that I could use a remote control to change the songs on the CD and raise the volume on my Performa 630. In other words, not needing a boom box. PowerPC 601: I loved creating videos and playing Marathon using the Power Mac 6100AV's built-in ethernet. Also, it was very powerful for its time. PowerPC 603: The Power Mac 6500 was cool because I could use the ethernet card from my old Performa 630 and control it with a remote. I loved the built-in video input/output and the Zip drive. PCI slots and the built-in subwoofer where my best friends. G3: The fast, portable, and expandable Lombard PowerBook G3. Nice black rubber grip with a DVD drive. G4: The Power Mac G4/450 Dual is fast, fast, fast. Extremely expandable, it can take a beating. It's super easy to open up and upgrade. My current setup is a PowerBook G4 667 DVI and a 1.42 GHz Mac mini that my wife uses. My Mac Plus is my web server, and a Power Mac 6500 is at the center of my home surveillance system. All my other Macs and a few PCs are for playing around and experimentation. I am currently a Network Administrator for the US Army. I have too many Macs - but never enough. I have a 3" colored Apple tattoo on the top of my back and am proud to say I am a Mac addict. If you want a pleasant, safe, reliable strong place to protect you and treat you nice, you don't have to go anywhere, you already have your Mac. Welcome to Mac Fallout Shelter.